Design and the interplay of materials for these Canadian-made frames. A bold combination of acetate and brushed titanium, the Rapp spectacles are in the image of their creator, inimitable. 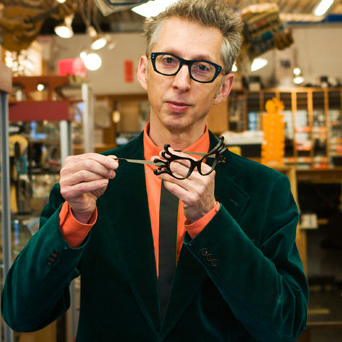 Founder of the brand in 1983, Mel Rapp has since entrusted to his son Shilo, who is a goldsmith, the designing of the frames and his wife Julia the color collection. Designed, assembled and hand polished in keeping with the original craftsmanship spirit, the Rapp frames are only produced in small series in the production workshop in Toronto. The characteristic design, in full color or transparent on the front, blends perfectly with the rough and refined cut for the metal temples, creative an elegant and distinctive frame, coveted by all connoisseurs.